Since I've been promising that I was going to get back on the horse and starting posting more frequently, I decided to use my day off for the 4th of July to tie this design. For those who may not be from the United States, the Fourth of July is a celebration of our Independence from Great Britain from which we celebrate by grilling steaks, making homemade ice cream and blasting fireworks. I finished off the steaks and ice cream and decided to leave the fireworks to someone else because I had a key chain on my mind that needed to get tied. While on my hiatus, I've been tying many different fobs by embracing some of the older types of knot designs. This design may look complicated, but it's really easy to learn. You can learn how to tie this design by following the tutorial from the Boondoggle Man. 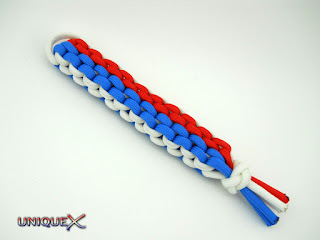 Since the tutorial from the Boondoggle Man is kind of difficult to follow, I am considering creating my own tutorial for this design, be sure to let me know what you think. Tying this design is fairly straightforward once you've got it started. 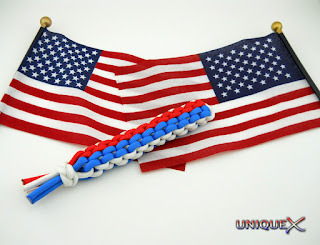 You will need three strands of paracord, two of the strands will be the same size, the other strand needs to be one and a half times longer than the other two strands. 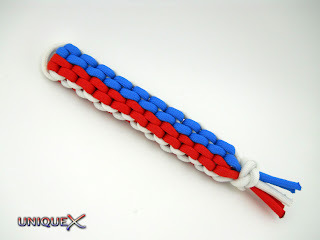 For this project, I used four feet of red and blue paracord and six feet of white. What a great timeless design. I love the patriotic colors. I was at a church camp last June and some of the kids were doing the two strand brick. One young girl thought she would be different and took three strands and had no clue as how to start it. Poor gal went to 5-6 adults before she came to me and asked if I knew how to get her started. Not having used plastic lace since the mid-late 60's it took me a minute or two but I got her started and she was the envy of all her friends when she completed her super brick. Thanks for the support Earl. I believe it's like they say "it's like riding a bike, you'll never forget", but if you're like me, it's there in my minds archive, but finding it is the trick. I have seen Bass Pro Shop now sells several versions of the survival bracelet. Would you happen to know what knots are used to tie these? The Teton was originally created by TIAT and is called The Back-to-Back Feather Bar. As for the Acadia, I don't know that I've seen this exact design before, however it appears to be a modified Stitched Solomon Bar.